Alto 800 2016-2019 is available in 2 different colors - Superior White and Silky Silver. Watch latest video reviews of Maruti Alto 800 2016-2019 to know about its interiors, exteriors, performance, mileage and more. Maruti Suzuki Alto 800 is the undisputed champion in the small car segment and an important car in company’s portfolio. The very first small car Maruti 800 was introduced which become an instant hit, after many years Maruti 800 was replaced by the new Alto 800. The Alto carried the legacy and became the bestselling car in the country since its launch in 2012. In 2016, the vehicle was provided with the mid-life update and given some cosmetic tweaks on the inside as well as outside to withstand the onslaught of newer cars in the segment. Maruti Alto 800 is the most pleasant and subtle looking car that has been based on the current Alto platform. Embracing the Aero Edge design, the hatchback gets leaner upper radiator grille and large trapezoidal lower grille. Headlamp cluster has been worked upon and character lines on the bonnet are new, providing the car with pleasing looks. From the side, Maruti Alto 800 looks like a typical Maruti car with flared wheel arches and more noticeable straight shoulder lines. At the rear, the car gets a new spoiler, small petal-shaped tail lights and body coloured bumper. 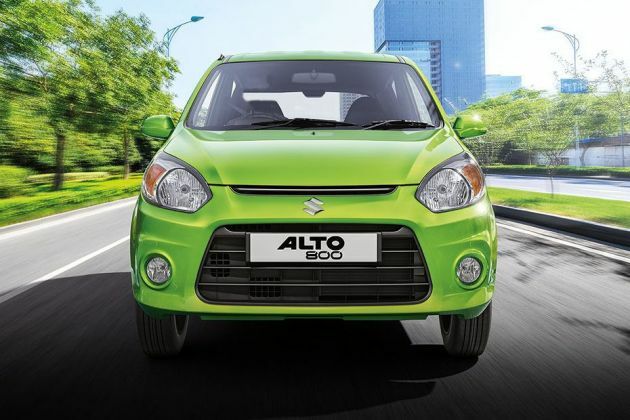 Maruti Alto 800 is available in 6 different colour schemes such as Blazing Red, Granite Grey, Mojito Green, Superior White, Cerulean Blue and Silky Silver. Coming to its interiors, as it’s a budget car, the inner profile is quite basic, to begin with. The dashboard is subtle colored with dark shade of grey and silver accents. The instrument cluster is elementary while it gets the simple three-spoke steering wheel. Central console has AC vents, dials for the AC and Audio system. Other features are new fabric upholstery, remote keyless entry, front power windows and front and rear console bottle holder. Talking about the powertrain, Maruti Alto 800 is powered by the same 796cc, petrol engine that can develop the maximum power output of 47bhp and generates the peak torque of 69Nm. The mill comes mated to 5-speed manual gearbox. The small hatch is also available in the CNG variant. In the safety department, not much you can expect from an entry-level budget car. But still, the car is being offered with safety aspects includes driver side airbags across the entire range. Other than this, the car gets tubeless tyres, front wiper and washer, engine immobilizer, collapsible door locking, headlight leveling and central door locking. Maruti Alto 800 is offered in 4 variants they are STD, LX, LXI, and VXI. Taking a quick glance at the pricing, its base variant is priced at Rs. 2.51 Lakh, LX trim is tagged at Rs. 2.83 Lakh while the top spec CNG LXI optional is available at the price tag of Rs. 3.78 lakh. Its mid-range, as well as the top selling variant LXI, is tagged at Rs. 3.09 lakh, all prices ex-showroom, Delhi. Maruti 800 competes against the entry-level hatchbacks including Hyundai Eon, Renault Kwid, and Datsun Redi-GO. Inside, what looks fresh is the new fabric design embossed on the door panels and revised upholstery for the seats. The plastic on the dashboard is slightly on a better side but still behind the competition. The same three-spoke steering wheel feels is as solid it was before. The backrests of the front seats in the new Alto 800 have been nicely created to make more space. The seats also offer adequate bolstering and comfort for the daily commute. The rear seats can conveniently absorb two adult passengers while the front has a reasonable amount of head and leg room for individuals with average height. As far as the audio system is concerned, Maruti offers a single-din unit with connectivity options such as USB, Aux-In, and FM. The sound quality that comes from the 2-speakers is decent enough to keep you calm and relaxed in your day to day commute. Other convenient features in the car include front power windows, remote keyless entry, utility rack, driver and co-passenger storage pocket, and front and rear console for bottle holder. Overall, the car offers almost a bit of everything in the limited budget. However, some basic features that are present in the rivals are still missing in this car. The front fascia is where the majority of the changes have been done. Rather going for the thin chrome grille with body colored slat, the carmaker has given a solid piece of plastic that neatly flows between the headlights and the airdam. Due to the updated front, the car looks wider in proportion. The headlamps cluster now features amber-colored housing for the turn indicators. The automaker has included fog lamps which were not there in the earlier model. The side profile is similar and showcases the simple straight shoulder line. The rear end features crystal-like tail lamps and some sculpting which are carried forward from the previous model. The bumper design is also the same with the space for registration plate carved out at the bottom. Overall, there are changes at outside but to find out what’s everything new, you need to be an Alto fan. The carmaker has added new thermal ignition system in the car which has bettered the fuel efficiency by 9 percent. The new Maruti Alto 800 now returns 24.7kmpl as compared to 22.7kmpl in the previous version. The CNG powered Alto 800 returns mouth-watering mileage of 33.44km/kg. The car is able to deliver the decent ride quality given its dynamics. The suspension setup has been carried forward. The ride quality is pliant and the suspension reduces the jerks arising from speed bump and potholes. The vehicle gives comfortable ride quality at low speeds. So it’s better to keep the needle below 80kmph to avoid bouncy experience. The updated Alto 800 continues to be powered by 800cc 3-cylinder petrol engine which produces 47bhp and 69Nm of max torque. The same 5-speed manual gearbox is on offer, however, if you want clutchless driving experience, then shell out some more and get the powerful Alto K10 model. While the figure might not impress many but one thing that can’t be overlooked is the light weight design of the hatchback. And this does not make it feel underpowered at all. Braking performance of the car is satisfactory and will do the job keeping the regular driving style in mind. On the safety front, the new Alto 800 comes with driver side airbag with features such as front wiper and washer, collapsible door locking, headlight leveling, engine immobilizer and central locking.